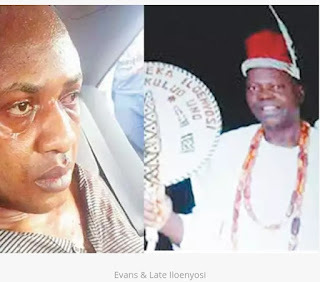 Former Super-Eagles’ defender, Chikelue Iloenyosi, has given a detailed narrative of how his father – Pa James Iloenyosi – was kidnapped and murdered by suspected kidnap kingpin, George Dumeme Onwuamadike, popularly called Evans, after collecting N15 million ransom. Chikelue, who played professional football in France and Turkey, described his family’s encounter with Evans and his gang as a lengthy hide-and-seek game. He said one early morning on November 25, 2013, his father who was 86 at the time, was on his way back from their local Catholic church when three SUVs double-crossed him and whisked him away. According to the football star, that fateful day was the last time he would ever see his father alive again. Chikelue, who is actress Stephanie Okereke-Linus’ ex-husband, told PUNCH Newspaper: “When they took him away, they did not talk to us until after five days. They phoned my twin sister. She was sobbing when she called me that the kidnappers had made contact. “Later, we left the Cotonou guy. Again, our private tracker traced him to Lokoja, Kogi State, ” he said. “When Nonso was arrested, he became submissive, and pleaded for his life; saying he would provide any information the police needed. The ex-footballer added that he was very hopeful at that point and believed he was indeed going to get his father back alive. It was gathered that the late Pa Iloenyosi was buried around Nneyi village in Umueri community. “We reburied him in at our hometown – Abagana in Anambra state – a few days after we found his body and started the search for Evans. One of the vital information Nonso gave us was that they were on their way to a robbery when they got information about my father and they diverted to Abagana to kidnap him.